The Brini Family vineyard is located in the picturesque hills of Blewitt Springs, a sub region of McLaren Vale on predominantly sand to sandy loam soil over clay. It was here that I saw a wild grumpy-looking and rather dozy koala sitting in a tree high above the ground just calmly keeping watch over the vines in the Brini vineyard. Sebastiano Brini immigrated from Italy in 1950 and the property was purchased in 1953. It was largely grazing land with some Shiraz and Grenache vines planted in 1947. Over the years, grapes have been supplied to some of the area’s finest red wine producers. In 2000 Sebastiano’s sons John and Marcello established Brini Estate Wines to produce small batches of premium quality wines from the vineyard they grew up on. These single vineyard wines embody the regional characteristics of Blewitt Springs – distinguished, elegant and rich berry flavoured. 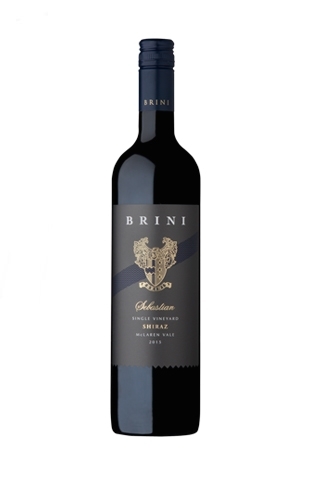 The Brini Estate Sebastian Shiraz is produced from low yielding fruit off marginally irrigated vines planted in the late forties. The 67 year- old vines are now producing stunning deeply textured complex Shiraz of the highest calibre. The powerful inviting youthful red colour reveals an elegant, finely structured wine with abundant spicy ripe blackberries throughout. It is matured in American and French oak barrels. The classic McLaren Vale intensity of the fruit combine with silky fine tannins to create a rewarding complex finish. It is matured in American and French oak barrels. Whilst drinking well now, it will reward cellaring for years to come. This premium wine will show itself beautifully with decanting.